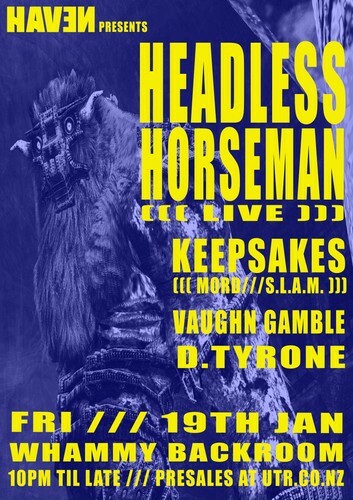 The mysterious veiled artist known as Headless Horseman has intrigued and excited the international techno scene since he first emerged in 2013. Through his impressive run of self-titled white label releases and his improvised live shows he has pushed a dark and experimental sound that often moves beyond the traditional four-to-the-floor rhythms of techno to provide a one of a kind experience that keeps audiences worldwide moving until the early hours. This reputation has earned him support from many of the genres biggest DJs and a busy international touring schedule that has earned him regular slots at renowned institutions such as Berlin’s Berghain and Tresor and recent visits to the Americas and Asia. This will be an intense show from one of the most respected live acts in the genre today, so bring your best dancing shows to stomp through the night. Tickets on sale via undertheradar.co.nz soon. We want this to be a friendly and inclusive environment for everyone no matter your race, gender, or sexual orientation. Please respect the other dancers. Zero tolerance harassment policy.